Joey Graceffa, Hannah Hart and LaurDIY are just three of the 75 “Featured Creators” that will attend Viacom’s 10th annual VidCon U.S. The company announced its first round of Featured Creators on Tuesday morning, which includes VidCon founders John Green and Hank Green, along with Miles McKenna, Tré Melvin, Karina Garcia, Jon Cozart, MyLifeasEva, Ricky Dillon, Safiya Nygaard, and Rafi and Benny Fine. The first round slate is available for viewing at VidCon.com. To commemorate VidCon‘s 10th anniversary, the company is also bringing back creators who were at the first VidCon, including some of the web’s earliest viral stars like Tay Zonday, who went viral after producing and singing an original he dubbed Chocolate Rain, a video that now has more than 100 million views. Other “Founding Featured Creators” will include Michael Buckley, Julia Nunes and Brittany Louise Taylor. The VidCon event is divided into three signature “tracks”: the Community Track, a festival that aims to connect fans with their favorite online video creators via parties, panels, concerts and meet & greets; the Creator Track, where creators and experts educate their peers and the industry about online video, including insights on how to create better content, secrets of growing audience and subscribers, and strategies to meet and collaborate with fellow creators; and the Industry Track, which brings top executives from the digital and entertainment industries together to discuss the state of the online video industry. In the past, the Industry Track has hosted speakers such as Instagram’s cofounder Mike Krieger, Facebook’s head of talent partnerships Bree Nguyen, YouTube’s chief products officer Neil Mohan, and Pinterest’s head of content and creator products David Temple. Originally started in 2010, VidCon was acquired by Viacom in February 2018. The first VidCon U.S. after the acquisition welcomed 74,000 attendees that included a mix of fans, creators, brands and industry leaders. The company has also expanded its reach internationally and has events in Australia and Europe. VidCon estimates that in 2018, VidCon US (Anaheim, CA), VidCon Australia (Melbourne), and VidCon Europe (Amsterdam) had more than 90,000 fans in attendance. Tickets for the 10th annual VidCon US, which will take place at the Anaheim Convention Center July 10-13, are now on sale. The streaming services are taking over the Emmys. Four years after “House of Cards” opened up the major categories to online content providers with three wins, Netflix, Hulu and Amazon have hit an all-time high with a combined total of 126 nominations. But how did we get here? Netflix seemed to be on a critical roll after “Orange is the New Black” debuted in 2014. It was nominated for 12 awards, including five in acting categories. Uzo Aduba, who plays Suzanne Warren, won for Guest Actress in a Comedy Series. She won a second time in 2015. The Tina Fey-produced comedy was called the “first great sitcom of the streaming era” and the Emmy voters seem to agree. Since premiering in 2015, the show has garnered 16 nominations. “Transparent” was — and still is — Amazon Prime’s flagship show. In 2015, following its debut season, it won an unprecedented five Emmy awards, including Outstanding Directing in a Comedy Series for Jill Soloway and Outstanding Lead Actor in a Comedy for Jeffrey Tambor. The show has been a continuous staple at the Emmys since. 2015 was a big year for streaming services at the Emmys. “Grace and Frankie” was yet another Netflix series that earned nominations in major categories. The show has continued to be a consistent presence at the awards ever since — specifically in acting categories. The big addition at the 2016 Emmys was the Aziz Ansari-led comedy “Master of None.” The Netflix series earned Ansari nominations for acting, writing and directing — and a win for writing with his colleague Alan Yang. He’ll get another shot in 2017 with more nominations in the same categories, including Outstanding Comedy Series. 2017 is a huge year for Netflix, with 91 nominations for the streaming giant overall. 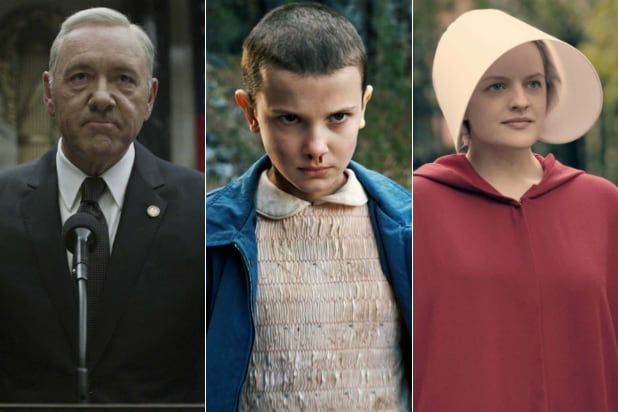 And sleeper hit “Stranger Things,”created by relative newcomers Matt and Ross Duffer, earned a staggering 18 of them, including Outstanding Drama Series. For a genre show released with little marketing, this is quite a feat. In 2017, Hulu established itself as a serious original programming contender with this adaptation of Margaret Atwood’s seminal novel. The highly acclaimed series not only became arguably the defining political commentary of the early Trump-Era, it also went on to make history for Hulu with 13 nominations. Hulu didn’t stop with “The Handmaid’s Tale.” This documentary about the Beatles earned five nominations. The anthology series didn’t qualify for the main Emmys until the third season arrived on Netflix. It got three nominations in 2017, including two for the episode “San Junipero” — which was nominated for Outstanding Television Movie, despite being a part of an anthology.